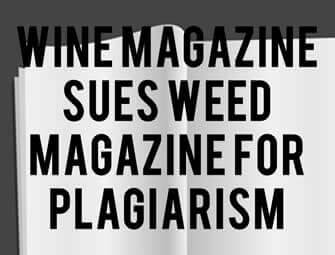 Wine magazine sues weed magazine for plagiarism. A wine magazine is suing a weed magazine for plagiarism. In a lawsuit filed in New York, the plaintiff seeks an award of triple its damages. The plaintiff accuses Modern Wellness of infringing its trademark. Among other things, Wine Spectator publisher says Weed Spectator is using its wine rating system. Lawyers for Wine Spectator publisher, M. Shanken Communications, filed the complaint on September 5 in New York. Modern Wellness owns Weed Spectator and the lawsuit says it plagiarised the rating system. Wine Spectator has been using the 100-point system to rate wines for decades. Now Modern Wellness is using is to rate cannabis strains under the name Weed Spectator. The plaintiff also says their website and social media pages are similar to their own. They further object to the use of the same logo font in its trademark application. The lawsuit says when doing an online search for Weed Spectator, Wine Spectator comes up. Marvin Shanken, plaintiff in the law suit, purchased Wine Spectator in 1979. He says Modern Wellness is trying to cash in on his valuable intellectual property. His magazine has 3 million readers and does not want an association with the weed magazine. Cannabis is an illegal substance in most US states. An association is likely to tarnish his own magazine. A magazine with a good reputation he has worked hard to build for almost 40 years. Wine Spectator, maintains a database of ratings for more than 337,00 wines. These are a core feature of the magazine. Retailers display these and paying subscribers can access online and using mobile apps. Magazine readers have access to wine news and educational articles, and videos of wine tastings and its production. Wine Spectator recommends wine retailers, restaurants and hosts wine discussions. Weed Spectator owners maintain a cannabis ratings database for paying subscribers. They also feature cannabis news and have a shop that sells CBD products. The lawsuit said the Californian cannabis magazine was blatantly ripping off the wine magazine. It is inferring an association with the wine publication. The logo and rating system are valuable assets of Wine Spectator. They identify the magazine as a high-quality publication belonging to M. Shanken Communications. And, have done so for many years. Shanken filed the court case to stop Weed Spectator infringing on his trademarks. He believes the defendants are taking advantage of his investment to infer the two magazines have an association with each other. According to the lawsuit, this is a blatant attempt to look like a legitimate organisation. And, the intention is to drive consumers to its website to make money. Shanken claims the owners of Weed Spectator are deliberately confusing consumers. The lawsuit values the damages at $75,000 and seeks triple this from the court. It also seeks the plaintiff’s court and lawyer’s costs. Shanken wants the owners of Weed Spectator to top using anything that may mislead consumers. He also wants them to destroy anything that links them to Wine Spectator.